We can use antibiotics in reasonably high concentrations to destroy susceptible bacteria and most spontaneous mutants, which may arise during the treatment period. Sometimes, the patient can be administered with two or even three different drugs simultaneously with the hope that each drug will prevent the emergence of resistance to other. This strategy is being used in treating tuberculosis and malaria. There should be very less use of broad-spectrum drugs. The pathogen should be identified and its drug sensitivity should be tested and the proper narrow-spectrum drug should be employed. The broad-spectrum drugs should be used only when they are necessary. The other option could be the structure based or rational drug design. If we know three-dimensional structure of a susceptible target molecule such as an enzyme essential to microbial function then we can use computer programs to design the drugs in such a way that they can precisely fit the target molecule. These drugs might be able to bind to that target enzyme and disrupt its role, which can lead to the death of pathogen. Pharmaceutical companies are using this approach to attempt to develop drugs for the treatment of AIDS, Cancer, Septicemia caused by lipopolysaccharides and the Common Cold. Also Read: How do Bacteria become Resistant to Antibiotics? Two new drugs are discovered, which is fairly effective against Vancomycin-resistant enterococci. Synercid is a mixture of the Streptogramins antibiotics, Quinupristin, and Dalfopristin that inhibits protein synthesis. A second line, Linezolid (Zyvox), is the first drug in a new family of antibiotics, the Oxazolidinones. It inhibits protein synthesis and is active against both Vancomycin-resistant enterococci and Methicillin-resistant Staphylococcus aureus. phage preparations are given intravenously to treat Staphylococcus infections. 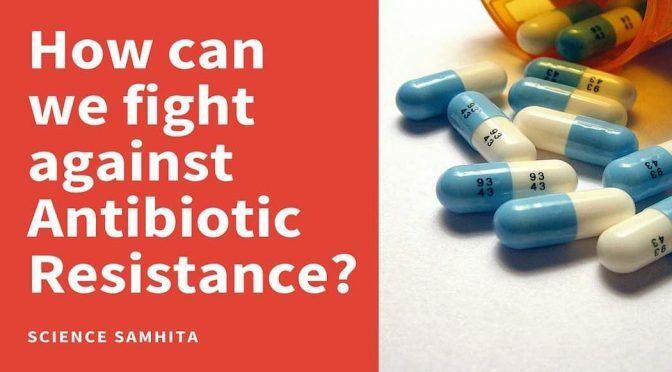 How can we help in the fight against Antibiotic Resistance? Using antibiotics only when prescribed by a doctor. Completing the full prescription, even if the patient feels better. Avoiding the use of antibiotics in the first place, you can have them if the matter gets very serious. Using natural antimicrobials (such as Garlic) as the alternatives for mild infections. Never underestimate the power of our immune system. It is very much capable of fighting any kind of infection. Also Read: 11 things Parents should know about Antibiotics before giving them to their Child. Enhancing infection prevention and control. Prescribe antibiotics only when they are truly needed by the patients. Prescribing the right antibiotic(s) to treat the illness. Teaching people better use of antibiotics instead of writing down prescription ASAP. Strengthening resistance tracking and laboratory capacity. Regulating and promoting the right use of medicines. Fostering innovation and research and development of new tools. Previous PostHow do Bacteria become Resistant to Antibiotics?Next PostHow a 2 meters long DNA is fitted into a 2 micrometers Nucleus?